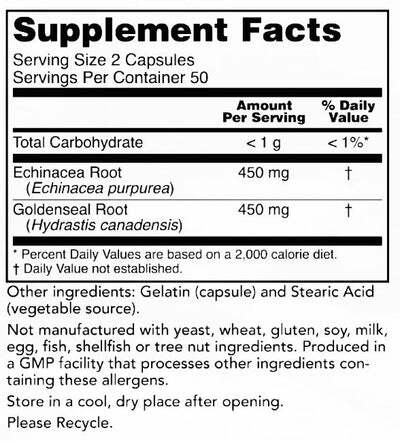 What is Echinacea and Goldenseal Root? The combination of Echinacea and Goldenseal is often used during cold and flu season to boost the immune system. Echinacea has been used for over 4000 years in traditional herbal medicine, using both the roots and flowers of the plant. Goldenseal is a member of the buttercup family, and only the root portion of the plant is utilized for its therapeutic qualities. Echinacea is believed to function as an anti-viral and often used for respiratory infections. The active chemical in Goldenseal is called Berberine, which is often used to fight various infections. It also functions as an expectorant, which may alleviate symptoms of chronic cough. How does Echinacea and Goldenseal Root support health? Used most frequently to help ward off the flu and common cold.